How we will build a consistent lead- and customer-generating engine for your B2B business? For B2B businesses, inbound marketing promises higher quality prospects, more qualified leads, increased reputations, and growing customer bases. But if you’ve tried inbound marketing before — even worked with another agency — or you’re thinking about trying it, you know, you can’t just write a few blog posts, spiff up your website, send out a few emails, and expect the leads to start pouring in. It just doesn’t work — and it’s a waste of your marketing budget. We know how to make inbound marketing work for B2B. Maybe you’ve heard that from other agencies. What makes Innovative Marketing Resources different? The difference is our methodology, a tested strategy for B2B inbound marketing success we’ve developed and continue to hone over years of work with businesses like yours. It’s called the Content Marketer’s Blueprint, and in this free eBook for B2B business owners and marketers, we share how it works, how it came about, and how your business can benefit from its lead-generating, business-growing power. How we came to believe inbound is the most effective way to do marketing for B2B in the 21st century. 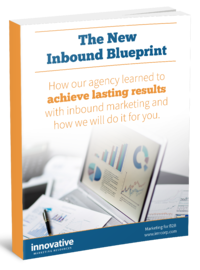 How our experience delivering and testing inbound marketing tactics with businesses like yours led to the development of the Content Marketer’s Blueprint, the most popular inbound marketing strategy ever. What to expect when we work with you to create, implement, and refine a customized inbound marketing strategy for your B2B business. The guidelines we use to discuss pricing with new clients. How to get a free inbound marketing assessment for your business from our team.